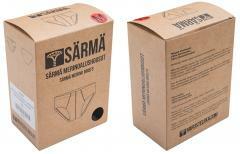 These are traditional men's briefs, made of Merino wool. Too often you see this kind of undies made of cotton, but these woolen briefs are way better and fit nicely too, without looking too audacious. 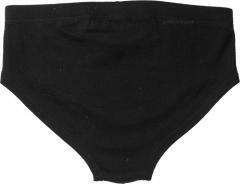 The front is thicker due to a double layer, as usual with this style of underwear. Unlike with cotton, it doesn't mean sweaty dampness even when you are standing still on a hot day. The waist is elastic to keep 'em up. These are made from 190 g/m2 100% Merino wool. Wash in 40 degrees Celsius, wool program. We recommend detergents specially made for wool. Washing these is not necessary as often as with cotton or synthetics, because wool is naturally resistant to soiling, however being what they are, it's probably wise to wash them regularly. In the brackets you'll find a suggested waist size. Two things you should note: first off the material is stretchy, so if you prefer a close fit, pick a smaller size. They won't be too tight or uncomfortable, we swear. Second, the gaps between sizes is bigger in large sizes, so our 3XL is bigger than many other brands. Designing a good pair of briefs is no joke. We did a lot of trial and error and these came out proper well, probably the best I've used so far. You can tell a good pair of underwear from the fact that you don't feel them at all. With cotton underwear the grim reality reveals itself when you take them off, first prying the moist cotton off your skin and then smelling the sweet, fresh nether region odour. With Merino woolen briefs both of these phenomena are seriously diminished, and you don't even have to hang the pants on the clothes line for two days after washingto get them dry. Underwear is something you wear for the whole day, every day (unless you go commando). Do not cop out on them! Tähän asti lupaa hyvää! Erittäin mukavat päällä eikä tosiaan tarvi pestä yhtä tiuhaan kuin poly-puuvillaisia. Otin pähkäiltyäni M-koon (vyötärö just M/S välissä) ja hyvin toimii, mutta pienempikin koko varmasti venyisi. En vielä tiedä miten kestävät kulutusta, päivitän arvostelua sitten aikanaan kun selviää.. Very promising up to now! Extremely comfortable, and don't need washing anywhere near as often as poly-cottons. I eventually chose an M size (waist is in between M/S) and haven't regretted it, but I'm sure S would work just as well. No idea how well they cope with wear & tear, I'll update on that when the time comes..
Hyvät ja mukavat kalsarit. Vaikka asettuvatkin pelottavasti nivusten seudulle, eivät ilokseni hiertäneet. Iso miinus lekan omista XXXL2-kokoisista pesulapuista, joita pois ottaessa kuului ikävä rasahdus. Lekan omien pesuohjelappujen kanssa eläminen on täysi mahdottomuus, joten ehdotan samanlaista ratkaisua kuin mil-tecin kalsareissa, tai edes inhimillistä poistettavuutta. Aivan ihanat. Parhaat alushousut ikinä, tosin olen käyttänyt vasta 2 päivää. Palaan asiaan, jos mieli muuttuu. Vihdoinkin Leka onnistui tekemään täydelliset alkkarit, kaikissa aiemmissa malleissa on ollut jokaisessa omat vikansa. Superb fitting. as an example, 4 days in a row, no shower plus training, no smell, wonderful feeling. Only downside is that they will become loose, so functional life is not that long. Still usable, though. 5/5 laatuvaikutelma, mutta koko kannattaa oikeasti miettiä kunnolla. Itse olen meinaan leveä, 190cm mies ja en asiaa tarkemmin miettinyt, olin vain kyllästynyt marketin epämukaviin ja kiristäviin alushousuihin ja halusin kokeilla jotain parempaa. Kangas tuntuu todella hyvältä kädessä, mutta nämä ostamani 4XL kokoiset on niin isot että niitä täytyisi käyttää henkseleiden kanssa. Päälle ei ole edes tarvinnut kokeilla, mutta eihän alusvaatteita voi koskaan palauttaa, ei niitä kukaan halua ostaa vaikka kuinka vakuuttaisi käyttämättömyyttä. Mutta joo, kangas on tosi kivan tuntuista ja varmasti mielyttävää ja kestävää, kuten myös työn laatu, muistakaa vain se koon huolellinen valinta. I use these to compliment my merino long johns for winter camping. Very comfy. I don't typcially wear underwear like this, I prefer boxers but these are very pleasant to wear. Would like to see an off white color to match the shirts.